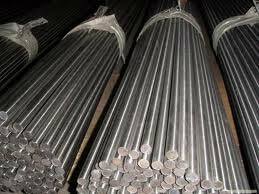 We bring forth a quality range of, Ball Bearing Steel Bright Bars, in the market. We use EN-31 and SAE-52100 type of steel for manufacturing these Bright Bars. These are spheroidized annealed cold drawn / ground bars produced from hot rolled bars/wire rods. These have high resisting nature against wear and severe abrasion. Its components can be subjected to high surface loading.These are widely used in manufacturing ball, needle and taper roller bearings, taps, drills, punches, injector pins, dowel pins etc.